Block Mystery Crew: Dracula Castle is a new escape created by Selfdefiant for Melting-Mindz.com. Your van broke down near Dracula's castle. You went up to look for help and the next thing you knew your friends were all gone! Now, you must find them! where is red shape for mystery machine? Nice game! Thanks S.D. and Melting Mindz. I never found a red shape Hotz. just bf'd it and it opened. wasn't it 1 of the red flowers (petals)...? OMG, what an awesome Lego set! I loved using the features as part of the game. Cute game! It was confusing to me that there were 2 silver keys. I restarted, thinking that mine had disappeared. I never saw the red shape clue either. That was an innovative idea, using the Lego set. Great stuff!!!! A small dollhouse up close would be cool too..
Wow, something original! Thank you SD! I won´t do any of those Lego advertising games - awful! helmutbuchner83, you are too funny! There's no advertising and no mention of the word Lego! Go find something else to do! stuck after green spot appears. reloaded game and got past and out. good game. Nice one SD! Love the graphic style and quirkiness to this one. Somehow my red and green gems turned into a potion bottle called a magnet??? Well that was different, and very enjoyable. Great job. this format was delightful! thx SD! VERY innovative and fun. 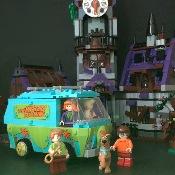 The mansion is the one Scooby Doo set I don't have. I loved it! Great job SD! keep them coming. Interesting style. Something new. Music tunes are nice. The start of the intro tune reminded of the old Peanuts theme. Don't know how many people here will remember that. Beautiful setting: an very innovative use of Lego.